The Sparta aquifer is an aquifer of regional importance within the Mississippi embayment aquifer system. It consists of varying amounts of unconsolidated sand, inter-stratified with silt and clay lenses within the Sparta Sand of the Claiborne Group. It extends from south Texas, north into Louisiana, Arkansas, and Tennessee, and eastward into Mississippi and Alabama (fig. 1). On both the west and east sides of the Mississippi embayment, the Sparta aquifer is exposed at the surface (outcrops) and is locally unconfined; it becomes confined as it dips toward the axis of the embayment, (generally corresponding with the Mississippi River) and southward toward the Gulf of Mexico where it is deeply buried in the subsurface (Hosman, 1968). Generalized ground-water flow in the Sparta aquifer is from the outcrop areas to the axis (center) of the embayment (fig. 2). In Arkansas, the Sparta aquifer outcrops parallel to the Fall Line at the western extreme of the Mississippi embayment (the Fall Line is a line dividing the mountainous highlands of Arkansas from the lowland area); and the formation dips from its outcrop area to the southeast. The Sparta aquifer supplies water for municipalities, industries such as paper production, and to a lesser degree, irrigation of agricultural crops (fig. 3). This report highlights hydrologic conditions of the aquifer in Arkansas County as an example of how water use is affecting water levels. Figure 1. Regional extent of Sparta aquifer within the Mississippi embayment aquifer system. Figure 2. Generalized schematic of geohydrologic west-east cross section illustrating trough-like appearance of embayment and generalized flow directions. Figure 3. 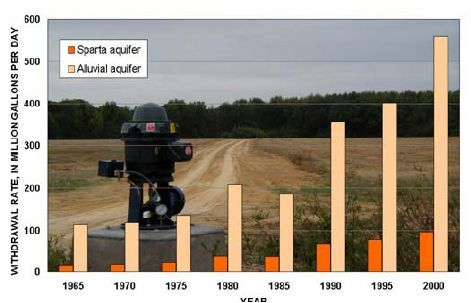 Municipalities and industries are principal users of the Sparta aquifer; agricultural use is increasing (Photos courtesy of U.S. Department of Agriculture Natural Resources Conservation Service and Pine Bluff Chamber of Commerce). The Sparta aquifer is an excellent source of water because of favorable hydrogeologic characteristics. The thickness of the Sparta aquifer in Arkansas ranges from less than 100 feet (ft) near the out crop area up to 1,000 ft in the southeastern part of the State (Payne, 1968). Through most of the aquifer's extent in Arkansas, it is underlain by the Cane River Formation and overlain by the Cook Mountain Formation. These two formations are low-permeability, fine-grained, clay-rich units that confine flow within the much more permeable sands of the Sparta Sand. Water enters (recharges) the Sparta aquifer from the outcrop areas and adjacent geologic units. The outcrop areas provide hydraulic connection between the aquifer and surface-water sources such as rivers, lakes, and percolation of rainfall. Before development of the aquifer as a water resource (predevelopment), flow in the aquifer was predominantly from the topographically high outcrop areas downdip to the east and southeast. The aquifer in Arkansas County is confined by the Cook Mountain confining unit. Depth to the Sparta aquifer in Arkansas County ranges from 300 to 700 feet below land surface, with thickness varying from 500 to 800 feet. Storativity and hydraulic conductivity are used to quantify the ability of an aquifer to store and transmit water. Hydraulic conductivity affects the yield of water to wells. For the Sparta aquifer, hydraulic conductivity generally ranges from 10 to 200 feet per day (ft/d) with an average of about 70 ft/d over the extent of the Mississippi embayment (Hosman and others, 1968). Individual wells completed in the Sparta aquifer (excluding those wells located within areas of large drawdowns) generally yield 100 to 500 gallons per minute (gal/min). The amount of water that can be released from storage in a confined aquifer is measured as storativity and is dependent on aquifer thickness and changes in hydraulic head (decline in potentiometric surface or "water level"). For equal declines in water level, the amount of water released from storage in the Sparta aquifer (assuming confined conditions are maintained) is about 1,000 times less in comparison with that released from an unconfined aquifer like the Mississippi River Valley alluvial aquifer (commonly referred as the alluvial aquifer). Therefore, large water-level declines over extensive areas would be required to achieve equivalent water yields. 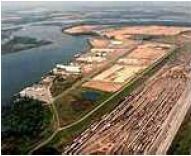 Many industries are located in eastern and southeastern Arkansas because of the availability of abundant water of excellent quality from the Sparta aquifer. 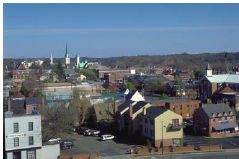 Many cities and communities rely exclusively upon the Sparta aquifer for their public water supply and use the water with minimal treatment. However, high salinity, iron, and manganese concentrations limit the usefulness of water from the aquifer in some areas (Hosman and others, 1968). Withdrawal of ground water from the Sparta aquifer began in the early 1900's primarily for industry and public supply. Total ground-water withdrawals from the Sparta aquifer in Arkansas have increased from 106 Mgal/d in 1965 to an estimated 265 Mgal/d in 2000 (Halberg and Stephens, 1966; T.W. Holland, U.S. Geological Survey, written commun., 2002). The majority of ground-water withdrawals in Arkansas County is from the more shallow and transmissive alluvial aquifer for rice and soybean crop irrigation because it is more cost effective to pump. However, where water-level declines in the alluvial aquifer are causing decreased well yields, the Sparta aquifer is increasingly used to supplement supplies needed for crop irrigation. In 2000, approximately 85 percent of total ground-water use in Arkansas County came from the alluvial aquifer with the remaining 15 percent from the Sparta aquifer. Withdrawals from the Sparta aquifer in Arkansas County (fig. 4) increased from 17 Mgal/d in 1965 to 97 Mgal/d in 2000, a 471 percent increase. Figure 4. Ground-water use in Arkansas County for the Sparta and alluvial aquifers from 1965 to 2000. In Arkansas, long-term pumping stresses in the Sparta aquifer have resulted in reduced amounts of water in storage, decreased well yields (Hays and others, 1998), regionally extensive water-level declines, and the formation of regional-scale cones of depression such as the cone that has formed between El Dorado, Arkansas, and Monroe, Louisiana. Additionally, cones of depression have formed in Union and Jefferson Counties and continue to grow; a recent cone of depression has formed in Arkansas County (Joseph, 1997; Joseph, 2000). In a ground-water flow system, water flows downgradient from potentiometric high areas to potentiometric lows. Pumping wells cause cones of depression in the potentiometric surface that alter the direction of ground-water flow (fig. 5). Extreme drawdowns have resulted in increased chloride concentrations of some Sparta aquifer wells in Union County (Broom and others, 1984) because of upconing of brackish water from below. Figure 5. Schematic of cross-section A-A' showing a well completed in the Sparta aquifer, observed potentiometric surface for 1997, and model simulated potentiometric surface for 2027. The response of water levels within the Sparta aquifer to heavy pumping stress can be substantial over large areas because of the confined condition of the aquifer. For example, an aquifer test near El Dorado resulted in a 6 ft water-level decline at a distance of 2,400 ft from the pumping well after 3 days of pumping at a rate of approximately 460 gal/min. Excessive dewatering of the Sparta aquifer and overlying confining units can lead to irreversible compaction (subsidence), reducing its water-yielding capacity and ability to be recharged. The rock and water of the Sparta aquifer and overlying units constitute a very large mass or total stress acting downward at depth in the aquifer. This stress is borne in part by the granular skeleton of the aquifer matrix (effective stress) and the fluid pressure of water in the pore spaces (Freeze and Cherry, 1979). When the fluid pressure is reduced, the effective stress increases, which can cause rearrangement of soil grains in the aquifer matrix resulting in compaction, thereby decreasing the rate at which water can move through the aquifer. If water levels decline below the top of a confined aquifer, the aquifer becomes unconfined (that is, the upper part of the aquifer becomes partially air filled) at that location and the fluid pressure becomes zero transferring all the stress to the aquifer matrix. Aquifers and confining units containing significant amounts of fine-grained materials--as the Sparta aquifer does--are most susceptible to compaction. Notable subsidence, which is sometimes associated with dewatering and compaction of an aquifer, has not been documented in the Sparta aquifer (Hays and Fugitt, 1999). 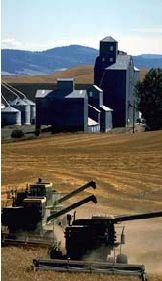 Examples of areas that have experienced substantial subsidence include the San Joaquin Valley in California and Houston, Texas (Galloway and others, 2000). Industry and municipalities began withdrawing ground water from the Sparta aquifer in the early 1900's. Predevelopment water levels were well above the top of the Sparta Sand. As early as the 1940's, substantial declines in water levels were documented in Union and Jefferson Counties in Arkansas (Baker and others, 1948; Klein and others, 1950). Substantial declines in Arkansas County have been documented only recently because of increased agricultural use from the Sparta aquifer. A computer model of the Sparta aquifer was created during the late 1980's (Fitzpatrick and others, 1990). 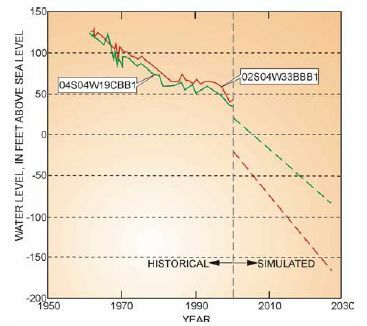 In 1997, the reverified model was used to simulate changes in water levels resulting from ground-water pumping from predevelopment to 1997 (Hays and others, 1998). Water levels then were simulated from 1997 to 2027 using predicted rates of water-use changes. Model simulations indicated that the cone of depression in Arkansas County will continue to grow, and will coalesce with the Jefferson County cone by 2027 if current pumping trends continue (fig. 6). Hydrographs illustrate observed water-level declines from 1961 to 2001 at two wells completed in the Sparta aquifer in north and west-central Arkansas County along with simulated declines extending through 2027 (fig. 7). Figure 6. Contour difference map between 1997 and 2027 simulated water-level altitude. Figure 7. Historical and simulated water levels for two wells in Arkansas County, 1961-2027. Volumes of water pumped from a ground-water system must come from some change in the water budget. This change occurs in one or more of the following: (1) more water entering the aquifer system (increased recharge), (2) less water leaving the system (decreased discharge), and (3) removal of water stored in the system (water-level declines) (Alley and others, 1999). The total amount of water entering, leaving, and the change in storage in a ground-water system must sum to zero, yielding a balanced water budget. Human activities, such as ground-water withdrawals, change the hydrodynamics of the ground-water system and the system moves toward a new "balance" or equilibrium state which changes the rate of inflow, outflow, and amount of water stored in the groundwater system. In Arkansas, massive cones of depression have formed in the potentiometric surface in areas where pumping has been heavy and continuously increasing for decades. As a result, more water must enter through induced recharge attempting to counter balance the withdrawal rates. However, when outflow exceeds inflow (withdrawal rates exceed ability of aquifer to replenish itself), then water levels decline as water is removed from storage to balance the water budget. The primary concern for the Sparta aquifer is sustainability--the development and use of ground water for an indefinite time without causing unacceptable environmental, economic, or social consequences. The term "sustainable yield" is used to define that quantity of water that can be withdrawn on a continuing basis without compromising the integrity of the aquifer with respect to agreed upon criteria. In Arkansas, the Soil and Water Conservation Commission (ASWCC) has established "thresholds of concern" to be used as criteria for designating a "Critical Ground-Water Area" (CGWA). For a confined aquifer like the Sparta aquifer, the criteria include: (1) water levels in wells must be above the top of the aquifer formation; or (2) the rate of decline in water levels in wells must not be more than 1 foot per year over a 5-year period. If these criteria are violated, the ASWCC may designate the area in question a "CGWA" (fig. 8). Figure 8. Eleven counties are currently designated as Critical Ground-Water Areas. Optimization modeling can determine pumping rates that are sustainable for all Sparta aquifer users. Can the Sparta aquifer be a sustainable resource without violating conditions defined by the CGWA designation? Management of the aquifer as a sustainable resource without violating established constraints is possible through the use of computer optimization modeling currently under development. This modeling will provide an optimal solution of pumping rates called sustainable yield designed to maximize water production without violating CGWA constraints. The sustained yield from the Sparta aquifer, designed to protect the aquifer indefinitely, can then be compared to total water demand to determine any "unmet demand" needed from alternate water sources. Baker, R.C., Hewitt, F.A., and Billingsley, G.A., 1948, Ground-water resources of the El Dorado area, Union County, Arkansas: Arkansas University Bureau Research, Research Series 14, 39 p.
Broom, M.E., Kraemer, T.F., and Bush, W.V., 1984, A reconnaissance study of saltwater contamination in the El Dorado aquifer, Union County, Arkansas: U.S. Geological Survey Water-Resources Investigations Report 84-4012, 47 p.
Fitzpatrick, D.J., Kilpatrick, J.M., and McWreath, Harry, 1990, Geohydrologic characteristics and simulated response to pumping stresses in the Sparta aquifer in east-central Arkansas: U.S. Geological Survey Water-Resources Investigations Report 884201, 50 p.
Freeze, R.A., and Cherry, J.A., 1979, Groundwater: Englewood Cliffs, New Jersey, Prentice-Hall, 604 p.
Galloway, D.L., Jones, D.R., and Ingebritsen, S.E., 2000, Land subsidence in the United States: U.S. Geological Survey Fact Sheet 087-00. Halberg, H.N., and Stephens, J.W., 1966, Use of water in Arkansas, 1965: Arkansas Geological Commission Water Resources Summary 5, 12 p.
Hays, P.D., and Fugitt, D.T., 1999, The Sparta aquifer in Arkansas' critical ground-water areas--Response of the aquifer to supplying future water needs: U.S. Geological Survey Water-Resources Investigations Report 99-4075, 6 p.
Hays, P.D., Lovelace, J.K., and Reed, T.B., 1998, Simulated response to pumping stress in the Sparta aquifer of southeastern Arkansas and north-central Louisiana, 1998-2027: U.S. Geological Survey Water-Resources Investigations Report 98-4121, 25 p.
Hosman, R.L., Long, A.T., Lambert, T.W., and others, 1968, Tertiary aquifers in the Mississippi embayment, with discussions of quality of the water, by Jeffery, H.G. : U.S. Geological Survey Professional Paper 448-D, 29 p.
Joseph, R.L., 2000, Status of water levels and selected water-quality conditions in the Sparta and Memphis aquifers in eastern and south-central Arkansas, 1999: U.S. Geological Survey Water-Resources Investigations Report 00-4009, 34 p.
_____2000, Status of water levels and selected water-quality conditions in the Sparta and Memphis aquifers in eastern and south-central Arkansas, 1999: U.S. Geological Survey Water-Resources Investigations Report 00-4009, 34 p.
Klein, Howard, Baker, R.C., and Billingsley, G.A., 1950, Groundwater resources of Jefferson County, Arkansas: Arkansas University Institute Science and Technology Research Services 19, 44 p.
Payne, J.N., 1968, Hydrologic significance of the lithofacies of the Sparta Sand in Arkansas, Louisiana, Mississippi, and Texas: U.S. Geological Survey Professional Paper 569-A, 17 p.